Oh and this: the Steelers-Broncos game was the most-watched wild-card game since 1988. In the final quarter-hour, the overnight rating was 31.6. Weird stuff man, weird stuff. As it turns out, the lone interception thrown in the game on Sunday night came from Ben Roethlisberger. What down and distance were involved when he threw it? Third and 16. Of course. Now let me state for the record, I know almost nothing about Tebow. For all I know he is probably a great guy, and sincere about his faith in Jesus. This post is in no way a criticism of him. However comments by others I have seen, including by some on my Facebook feed, have treated his 316-laden playoff performance as some kind of portent, a sign that God has ordained the victory of Tebow’s Broncos. Maybe God is writing it for him…check this out…. Let me get this straight. In 2010 7.6 million children under the age of five died around the world, most from easily preventable diseases. There are currently 40+ conflicts raging around the world with a total fatality list stacking into the millions. Millions of Christians around the world are persecuted for their faith, often suffering physical violence and death. Yet God chooses to involve himself in a football game? The idea that God is active in a sports game while millions of people around the world suffer reveals a disgusting sense of how many Christians view God’s priorities. I won’t make many friends by saying this, but perhaps it even strays into idolatry. Posted on January 12, 2012, in Current Events, Haphazard and tagged 316, Denver Broncos, Football, John 3:16, NFL, Tim Tebow. Bookmark the permalink. 16 Comments. Sobering and thoughtful Matt, and whilst I am excited for Tim Tebow’s success the adulation of his efforts and skills should in no way outshadow the suffering of humanity. Exactly. I’m not much of a sports fan, so it is fairly easy for me to say these things. However I don’t want people to get the idea that I am condemning their sports fan-hood. What I don’t like is when we imply God cares more for our entertainment than he does for global issues of suffering. You don’t know the full story. The guy was born in the Philippines to missionary parents. He has often said in interviews and every chance he gets that his passion is the gospel and the poor and he visits and supports orphanages in the Philippines every year. Before every game he gets down on his knees and prays something like “Whether we win or we lose I pray that all I do is give honour and glory to you Lord” He does this while mic’d up and heard by millions. He has a massive impact on everyone he knows. His coach from college broke down in tears and couldn’t speak for the whole press conference when it was time for him to leave because “it’s not just the incredible player he is on the field, it’s the person he is off it. The impact he’s had on my children…”. He couldn’t speak anymore after that. He’s often getting dragged on to the bus as he spends ages signing for kids and speaks to each one personally. His teammates speak about how he’s always like that- ‘flawless’. When his teammates make big mistakes he’s the first to go and talk to them and even though he is a rookie he speaks to them like softly spoken Dad, reassuring them and giving them perspective. While he’s on the field, while everyone else is trashtalking he’s asking his opponents ‘how’s the family?’ and how it’s good to see them. When he gets smashed, he gets up and shakes their hand and says ‘great hit’ with a big smile on his face. He’s just come from 6 games in a row where in the first 3/4 he had the WORST completion rates in the league and then in the last quarter he would have the best and game after game have these disney-esque comebacks and win the game. While everyone else around him was screaming and jumping, he drops to one knee and prays. He’s not your typical obnoxious quasi-religious American celebrity. He’s the real deal in HIS mission field. He’s making a living doing what he’s doing and he acknowledges that it is God helping Him, not because God cares about sport, but because he cares about people and this is giving him a pulpit. Many people are paying attention because of Tim Tebow. He is being salt and light more than many I’ve seen. It is typical that people will misunderstand him, especially Christians who will criticise him (as you’ve said, that’s not your purpose) but God has a funny way of reaching down to the mundane and revealing himself in it. I’m reminded of the the story of the anointing of Jesus with expensive perfume. You know better than most that God meets us where we are at. And to reach America, why not use a football star? You have to admit, the coincidences with 3:16 are freaky, seeming as they made a rule banning him from putting john 3:16 on the blacks under his eyes. Google searches of John 3:16 spiked massively because of his stats. Just like one might sell their sell soul to the devil, he has sold his soul to God and asked God to use him in this field. So is it any wonder that God might honour that? I appreciate your comment, but I think you missed the point a bit. As you pointed out, my purpose was not to criticise Tebow. Why go on a rant about it then? After all, I’m not questioning his integrity. I am criticising the view that God intervenes in sports games, implying that he is more concerned with our entertainment than with human suffering. Whether God uses the platform of football more generally to express his glory and goodness is a different story completely. This does not necessitate God intervening in particular sports matches. Though God may use the platform of football, I am cautious about saying so. I don’t exactly know how to communicate it, it is more of a internal sense, but God using flashy multi-million dollar platforms seems odd to me in light of Jesus’ incarnation. I hold this sense quite loosely though since I can’t put my finger on it. I see your point Dave. I think we can get so caught up in congratulating a particular celebrity for being a “good Christian” that we forget to do it ourselves. We can’t offload Christian responsibility to a few. I think it’s flawed to assume that God cares more about one thing than another. Does God care about suffering and starvation and so on? Absolutely. But we’re talking about a God who cares about a sparrow and dresses up lilies. God doesn’t need to prioritize anything what with being all knowing, all powerful, always present and so on. God certainly needn’t exclude football from a list of things that can bring Him glory. The article is very thought provoking and timely given the focus of human trafficking today, but what got me was talk about Gods priorities. It’s not that I do or don’t believe divine intervention was the reason the team won, but if God were to step in and give them the game then I don’t think that it would mean that he moved his eyes for a second from the suffering in the world. To believe that would mean that I am higher on the priority list than the suffering when He works in my comparatively petty and insignificant problems. The hype surrounding the story seems to be that the God that Tebow is glorifying cares enough about what Tebow loves that God would work, and show himself, through that love of his. It isn’t that God loves football, but is interested in our interests enough show himself through them. It reminds me of Jesus’ first miracle, He chose to reveal his glory for the first time by saving a party. There would have been people at that wedding with back problems and weird foot issues, but to save the party was culturally and socially in the interests of the people there. In that moment Jesus didn’t care any less for the hungry or those inflicted with oozing bunions, but he also valued the interests of the people that just wanted to have a good time. Then again, the whole story is slightly Bruce Almighty’esk, maybe God has a vested interest in promoting the newly announced sequel. Again, I think that people tend to react brashly to this kind of post. The whole point was a critique of the way we associate God with our own interests etc. I find it somewhat disconcerting when, in our prose, we talk about God’s willingness to be involved in, say, football in the same way we talk about God’s involvement in suffering. The implication seems to be that they are on the same or a similar level. Maybe I have misread this, but this is what it seems to me. Indeed, I have expended much effort over the years trying to convince Christians that God cares for the poor and that they should act. Question God’s involvement in a football game however and Christians get up in arms about it. There is something wrong with our priorities, and this is my critique. From what I see God does indeed prioritise certain things over others; certainly the Gospels present Jesus and God as having a special concern for the poor and marginalised. To appeal to God’s omnipotence and omnipresence, and his potential involvement in any and all things, does not necessitate that God does not prioritise one thing over another. Just because I have the power to both alleviate great suffering and effect the outcome of a wager does not mean I think both acts are of the same value. I also think Emily’s portrayal of the wedding at Cana story is somewhat incomplete in light of John’s whole Gospel. To assume that Jesus left people “with back problems and weird foot issues” to suffer while fulfilling cultural cues is to misrepresent the story, and to ignore Jesus’ later ministry in which he constantly flouted cultural norms in order to heal people. Thanks for the post Matt. I too think it is a bit far fetched to read into some of these numbers the way some people have chosen to. By the way, it doesn’t look like God did want the Broncos to win the Super Bowl… New England 45- Broncos 10. What a thrashing, hey? Kinda has a vague resemblance to Israel’s God-is-on-our-side-isms in the OT. Apparently witches are more powerful than God. Ha.. that’s halarious. Did you see the comments too? But notice there are no comments post game…. At best, Tebow is, as Kierkegaard would say, mediocrity dressed up as sincerity. But then, aren’t we all equally guilty of that particular sin? Tebow is just another tepid icon of the comfortable, reasonable and socially acceptable Christianity, that most insipid of institutions. We certainly don’t see him giving up his wealth (although the hospital is a nice touch, wonder how much of that funding he gets from donations?) questioning war or standing against social injustice. But he means well, which counts for a lot, right? And if we take stock in the numbers and see a spiritual war happening behind the scenes, well that helpfully distracts from the fact we don’t actually have enough faith to obey Christ’s commands, we’d rather fight illusions of our own making. But hey, we mean well, that counts for a lot, right? Faith and not works, all that jazz? The lesson to be taken from Tebow is that our standard for what it takes to be a good Christian is pitifully low, in the same way that Kierkegaard condemned the eulogising of Bishop Mynster. Recognition of what it means to follow Christ and embrace His suffering should make a man cry out “My God! My life would be ruined!” but compel him to follow regardless. Anything less than that is the most dangerous kind of mediocrity. And I don’t say that with judgement, just recognition of where we’re all at: I’m still kicking and screaming at the “My life would be ruined!” point of things. I fear that in the truest sense, it might be easier to embrace cognitive dissonance than ever become a Christian. As usual I am in complete agreement. No comments additional needed from me Wellsy. Peace brother. 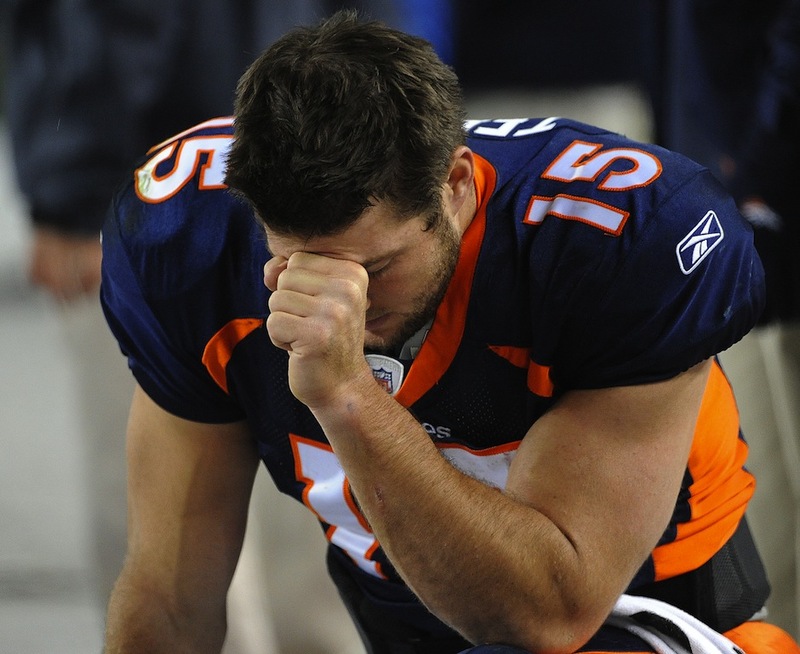 Since it’s clear God does more for Tebow than for me…why do I have to tell myself that groveling over Tebow might get God to do something for me?